“Pulling initial ideas together and seeing them form into beautiful things. I also love seeing my pieces worn by people, it’s a thrilling moment!”– Lucienne. I’m a multi-disciplinary artist. I have always painted as well as done pieces of performance. I have always had a strong interest in textiles and fabrics and for the last 3 years that’s what I’ve been concentrating on. 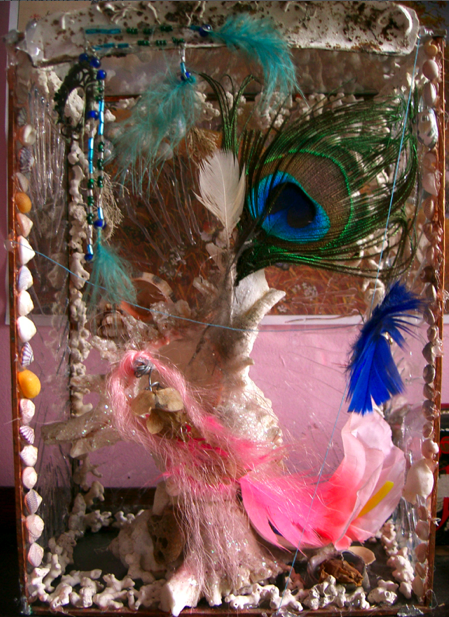 I make a wide range of things and some of my best pieces have come out of combining different artistic styles. 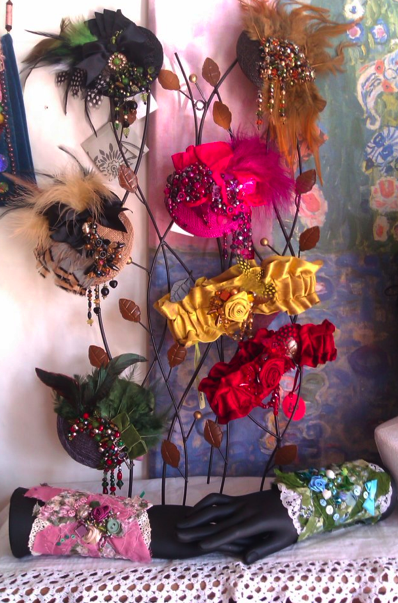 A few examples of things I make are head pieces, garters, cuffs and collars, fabric wedding bouquets and corsages. Finely detailed, sumptuous, dramatic, playful, theatrical. 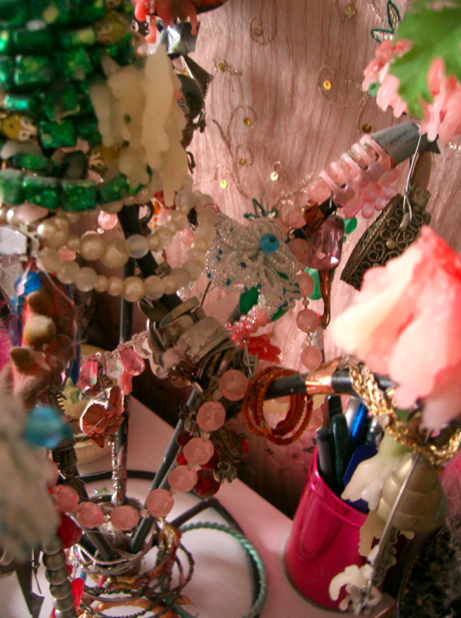 My 100% percent silk pieces in particular came about from wanting to produce work that was a keepsake in a throwaway culture – work with an element of the fantastical or magical…a hint of Elizabethan and Victorian…a found treasure. My tattercuffs probably, and the baby bunting. 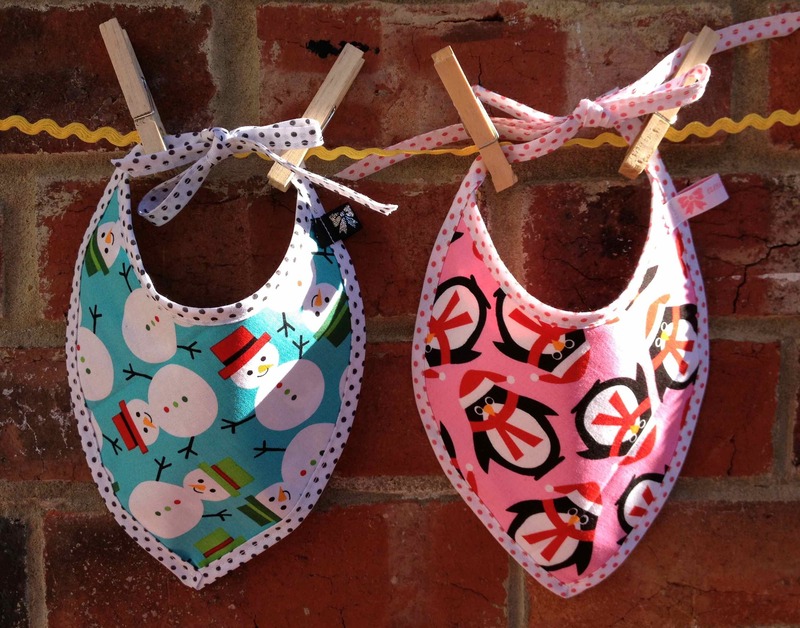 Everyone likes baby bunting – you can take it and have a little celebration anywhere. Pulling initial ideas together and seeing them form into beautiful things. 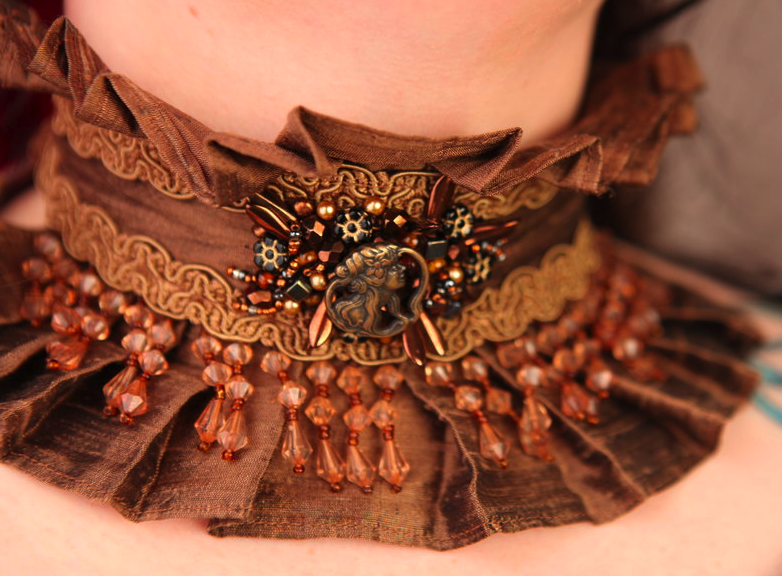 I also love seeing my pieces worn by people, it’s a thrilling moment! 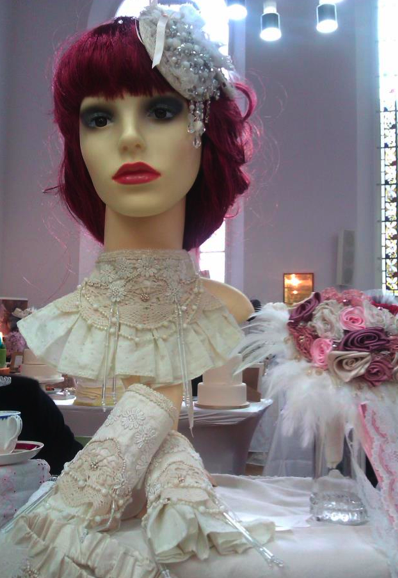 I have done several other events, including wedding fairs. I’m hoping to have my things in an open house next year. I also have some of my work displayed and for sale in what was Big Bead Boutique and is now The Parlour Rooms, on Dyke Road; and a selection of pieces in Velvet Tattoo on Norfolk Square. Obviously to keep selling more of my work and to continue building up my business and my customer base. I would also quite like to do some costume work, perhaps for film, theatre and television. I do really miss painting, so would like to do more of that in the next year. But mainly I just want to keep enjoying what I’m doing. “I would like to live in a cottage, with a herd of micro-pigs and some chickens and spend my time split between my sewing room and my allotment! In the meantime though, I’m quite happy to just spend a few hours a week with a needle and thread.”– Siobhan, The Cotton Elephant. 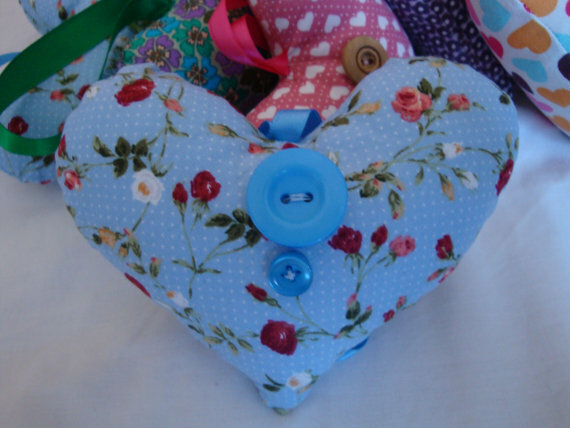 I am the Cotton Elephant and I make gifts, home wares and pretty things from fabric. There’s no theme to my creations as such; they’re just whatever pops into my head. 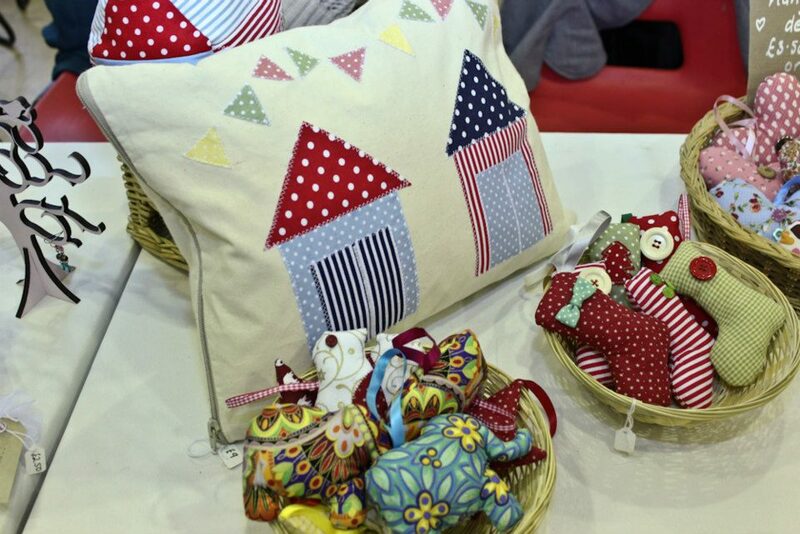 I particularly enjoy making patchwork quilts for babies, but I also like making smaller items such as cushions and decorations (including, of course, little Cotton Elephants). For the next Fairy Tale Fair I am working on a new range of Mothers’ day gifts including jewellery wraps and purses, which I will be selling alongside some old favourites such as my beach-hut door stops and applique cushions. My personalized baby blankets have been selling really well this year (something to do with the baby boom I think!) and that’s great because I get lovely pictures sent to me of super-cute babies enjoying tummy time on my creations! 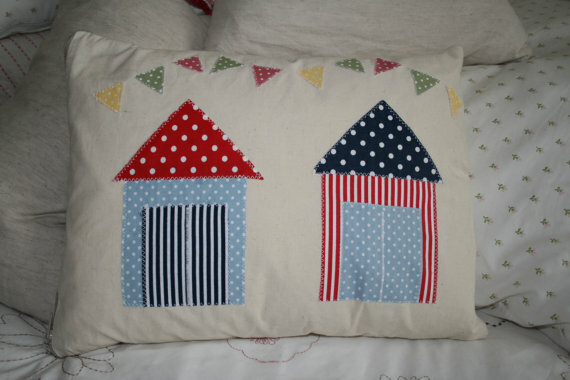 Items from my seaside range also sell well; I have sold some of my beach-huts as far as the USA. I have a busy and quite demanding day job which involves me spending most of my time in front of a computer. I really love being able to unwind in front of the sewing machine, or sitting with a cuppa and hand-sewing the final touches to a new creation. Sewing gives me the chance to be creative, which I wouldn’t really have otherwise. I have done two other Fairy Tale Fairs – they’re absolutely brilliant! I hope to do more fairs this year. 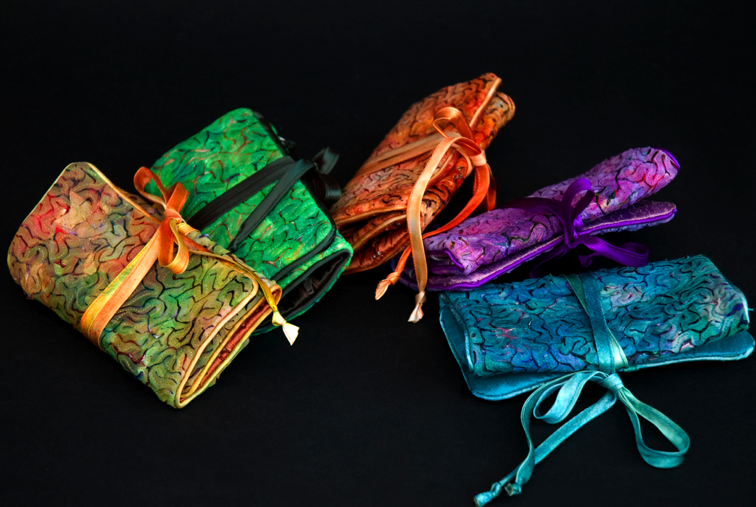 I’m making a range of products with some fab new silk fabric I have found; purses, make up bags and jewellery wraps which will make lovely gifts for mums. 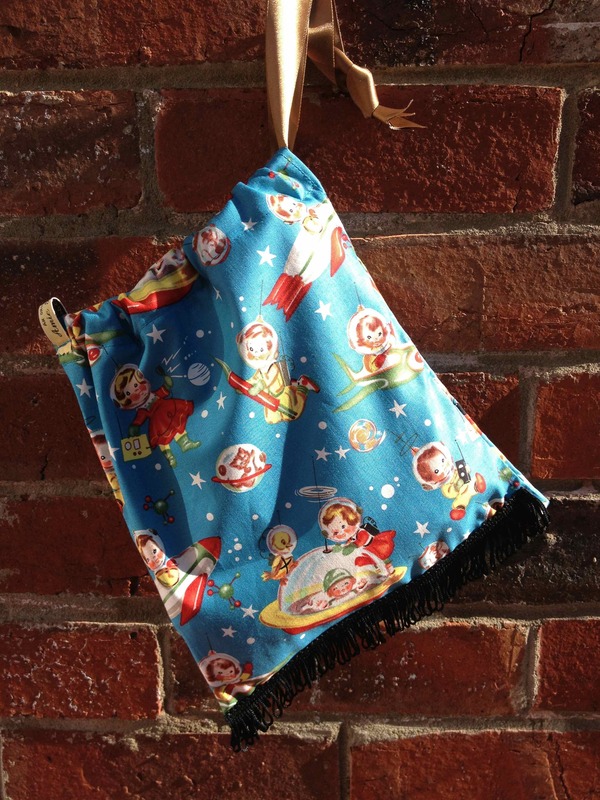 I’m also selling a range of smaller items which will make lovely little gifts. I loved it! Meeting so many other crafters and lovely members of the public was absolutely great. It was also really festive – and I LOVE Christmas! I would like to live in a cottage, with a herd of micro-pigs and some chickens and spend my time split between my sewing room and my allotment! In the meantime though, I’m quite happy to just spend a few hours a week with a needle and thread. We look forward to having her again on Saturday the 9th March- it’s going to be magical! “I’m really looking forward to the fairies getting me in the Christmas spirit and kicking off my seasonal celebrations in style.”- Tina, Georgie Arts. 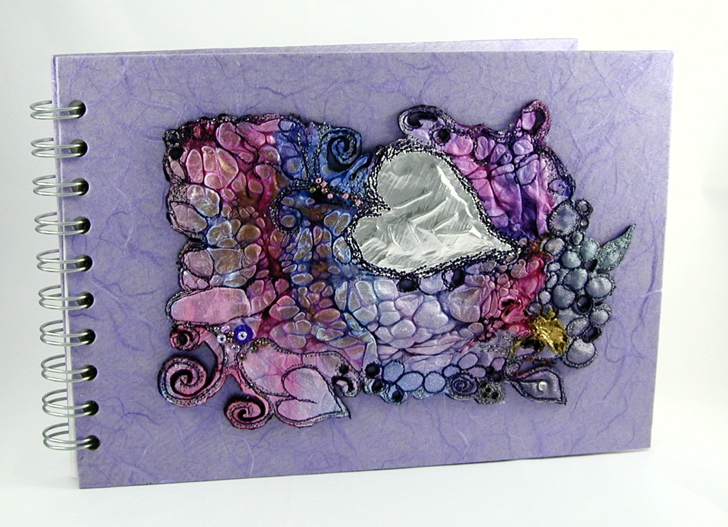 I’m a textile artists primarily specialising in embroidery, so make scrumptious, textured goods encrusted in embroidery and beading and full of rich colour. If I can find a way to stitch on it I will. What festive gifts and creations will you be selling at The Fairy Tale Fair? I’ll be bringing my ever popular occasion bags and greetings cards along with a wide selection of affordable gifts just right for filling all your loved ones stockings. 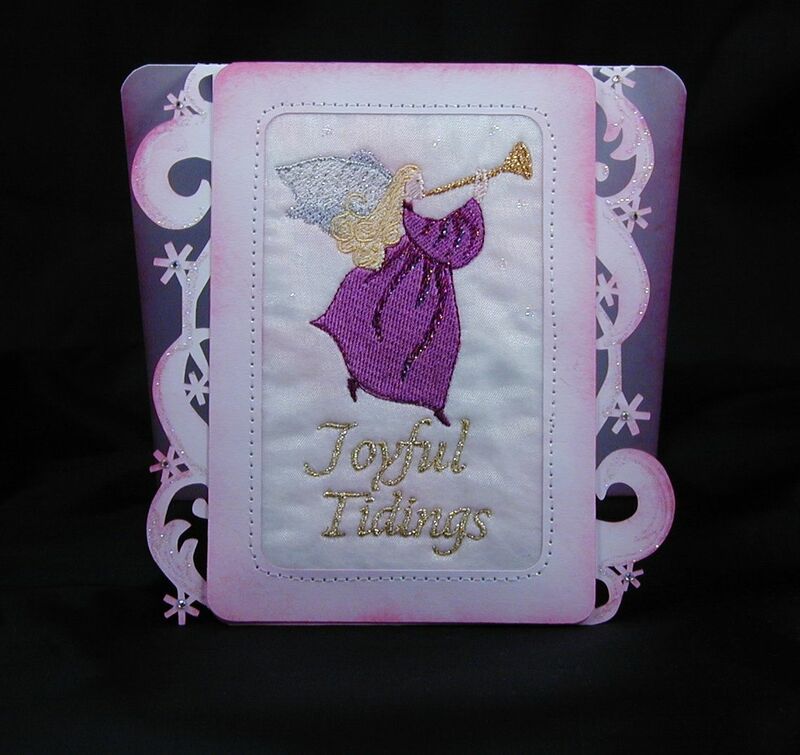 These will include sweet smelling fairy pomanders, little- but lavishly embroidered notebooks and albums, tiny treasure boxes, shadow boxes and much, much more. You took part in our last Fairy Tale Fair, did you enjoy it and did you find your creations were popular with visitors? Yes, we had a great day at the last fair, meeting customers old and new and really enjoyed the friendly fairy filled atmosphere. The fairy pomanders which made their debut at the last fair sold out and it was packed in the morning. I think everyone wanted to get the best of the gifts before they sold. I finally managed to shop myself in the afternoon and there was such a great range of goodies on offer it was hard not to splurge all the takings & leave with twice as much as I arrived with! Will you be taking part in other events over the festive period (fairs, open houses, markets etc…)? At the moment I’m not booked elsewhere as I’ve got orders to fill for special bespoke greetings and gifts which can be ordered through my website, but if I get cracking I might fit in another event. News will be on my website. But this is the main chance to snap up your ‘off the peg’ goodies. I’m really looking forward to the fairies getting me in the Christmas spirit and kicking off my seasonal celebrations in style. Georgie Arts looks forward to seeing you there and hopes you all enjoy a beautiful fairyfull Christmas and a peaceful new year. 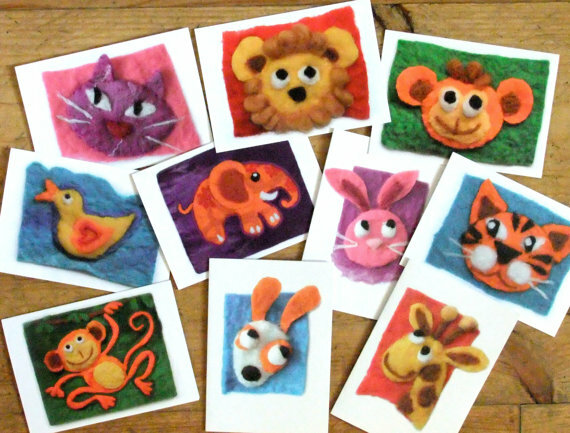 I am a felt artist creating unique animal inspired wall art for kids, cosy handmade floppy eared felted hats and pretty floral jewellery. More recently my ‘Brighton Rocks’ have joined my felted goodies. Bright, dynamic and tactile. My individual method of felt making results in highly colourful, stunningly tactile works of art that are rich in texture and depth! Rose brooches always sell well, either dainty and discreet or large and vibrant. 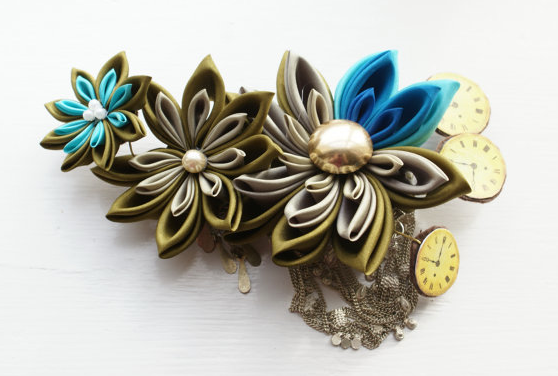 The fastening makes them a versatile accessory, worn as a hair piece or as a corsage. 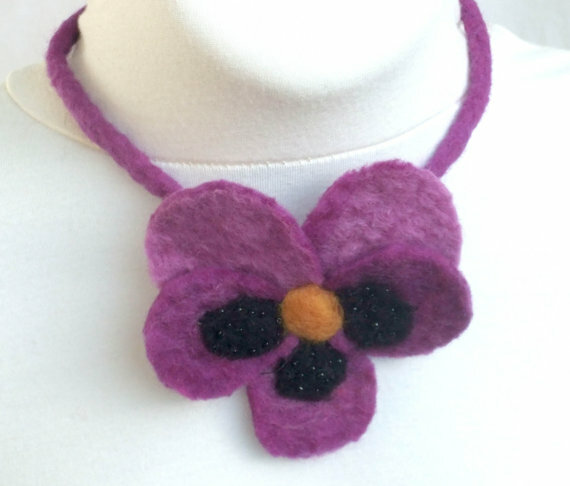 Felt is such a versatile medium that I am constantly experimenting and branching off into new areas. There is a whole world of inspiring techniques that I have yet to explore! I regularly attend the monthly Makers Boutique. I’ve taken part in Art Junky, The Brunswick Festival and Art Fair , The Brighton Mini Maker Faire and my work can be seen in Open Houses in the Fiveways and Dyke Road Trails. You will be providing a workshop for The Fairy Tale Fair- what will your workshop involve? I will be running a ‘Felted Soap Workshop’ where you will Create a gift using the wet felting technique to encase a soap in seamless Merino wool. 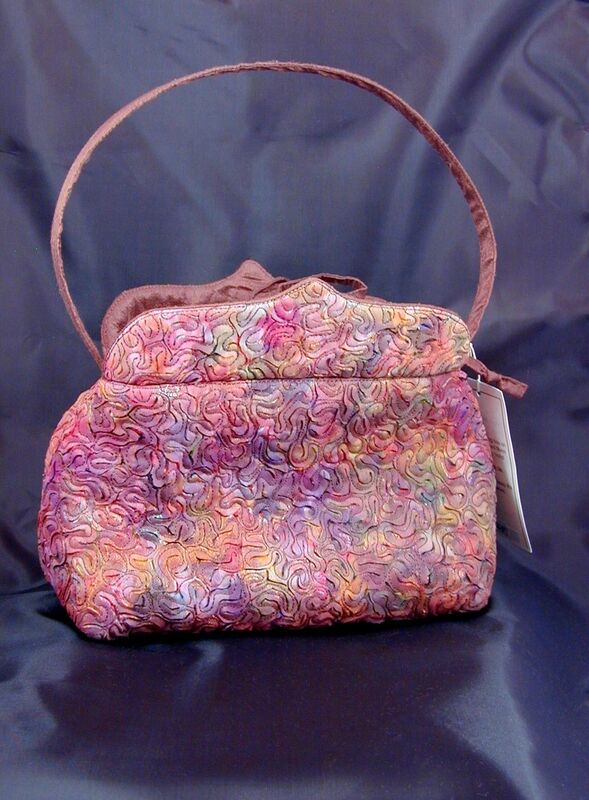 This work of art is meant to be used as a scrub – you are still felting it as you use it! 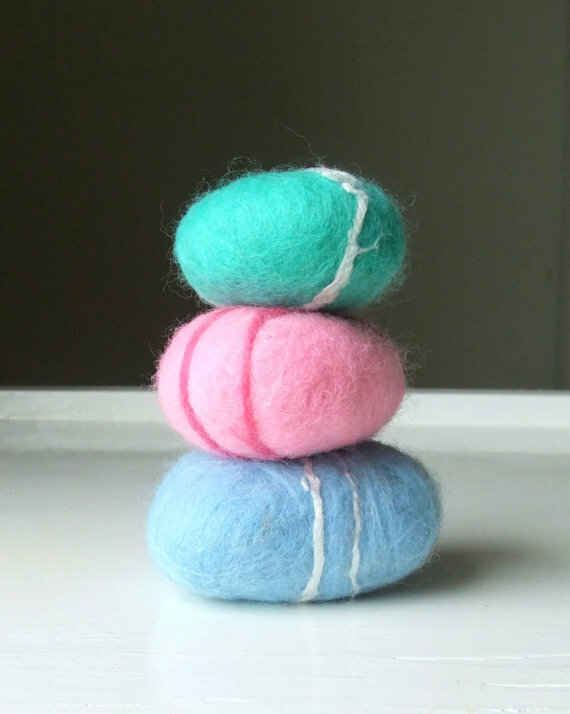 You can alternatively take part in the popular ‘Felt a Brighton Rock Workshop’. Earlier this year I ran a couple of ‘Whole Class Workshops’ in schools where we made some stunning large scale wall hangings. This is a direction that I definitely would love to be more involved in. 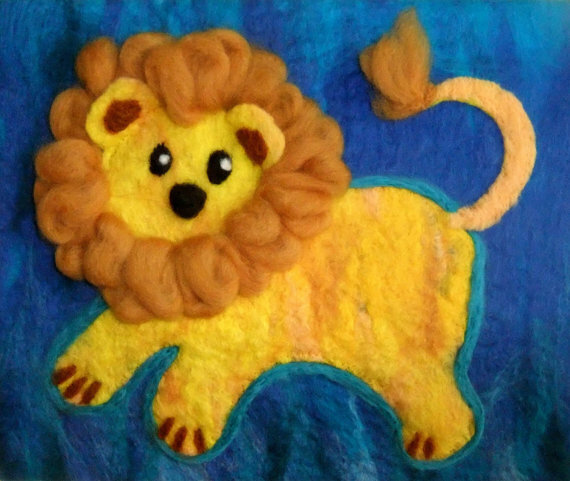 In the meantime I have taken the plunge and announced some dates for my own felt making workshops. 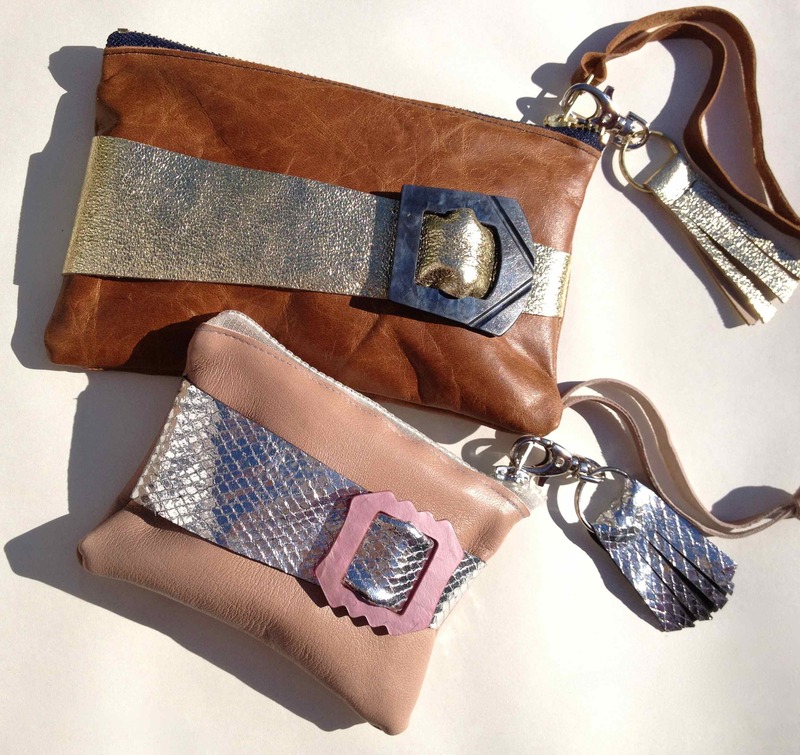 Say Hello to Amie Boswell, who creates wonderful t-shirts, purses and more from the most beautiful fabrics! 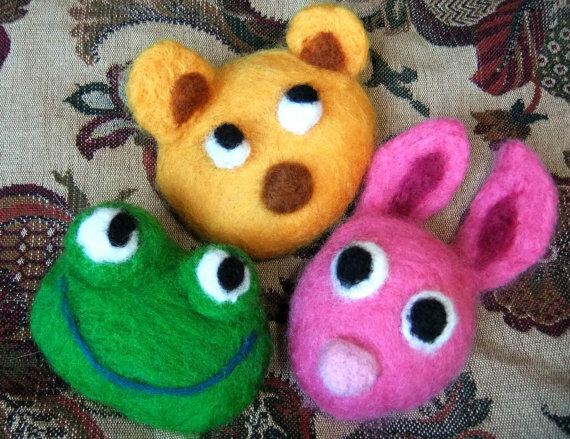 You may of seen Amie’s items for sale in The Cake House Artists Open House in Brighton, and we are happy to have her at The Fairy Tale Fair- perfect gifts for children! My style is a mix of lots of colour, pattern and texture. 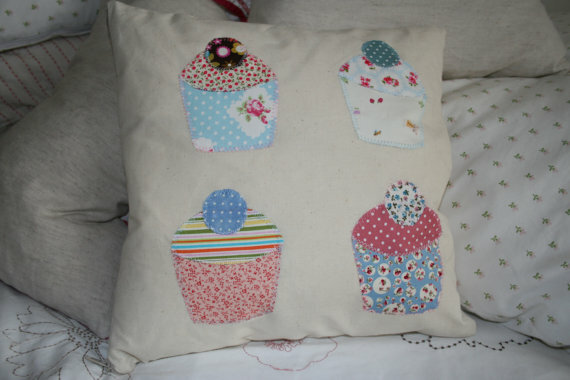 I take inspiration form lovely fabrics and vintage bits that I source. The fun bit is putting everything together and finding the best combinations to create a striking and individual look. I have been working on my products for about 10 years on and off but have had two little ones in that period too so off more than on recently…. Having children hasn’t stopped my flow of ides though, in fact quite the opposite. You can get away with much bolder designs for the kids and they always look so cute! 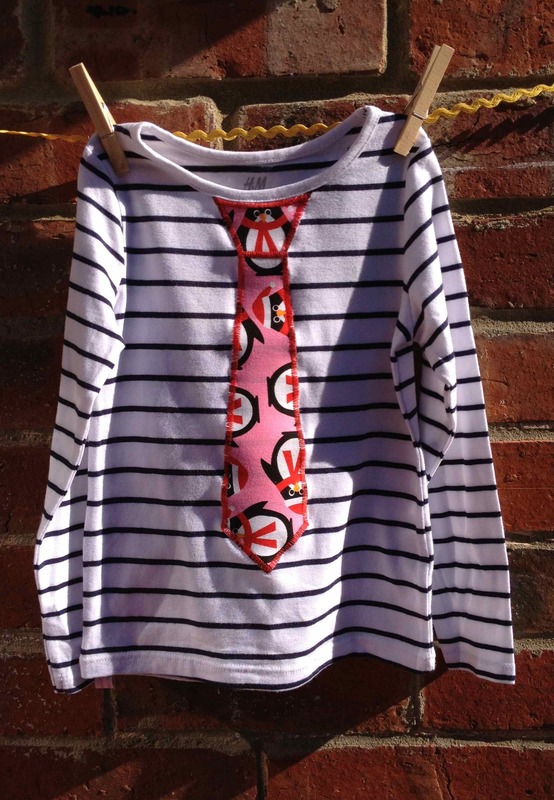 My best seller over the last couple of years is no doubt my tie T- shirt. Nearly every one is different and they are so easy to wear plus they look adorable. Having a bit of time to myself. I find it truly relaxing and am not happier than when i’m creating. The sourcing and combining of materials is definitely my favourite part. For the last few years I have been lucky enough to take part in ‘The Cake House’ open house in Brighton, run by Clair Letton. Now that I have a little more time to myself I will be looking for future stalls and markets though. Can’t wait…. 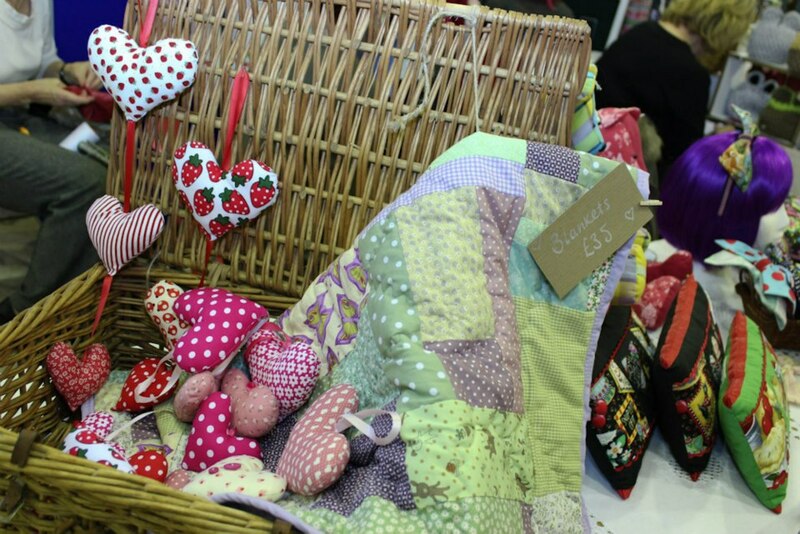 What items and festive gifts will you be selling at The Fairy Tale Fair? I will have; tie T’s, Festive p.j’s, leather purses, canvas drawstring bags, baby bibs, bunting and a few other little accessories and gifts. At the moment I am working on relaunching my website , Amieboswell.com, which should be ready for November. In the new year I will be looking for outlets and future events to take part in so if anyone has any ideas please let me know. 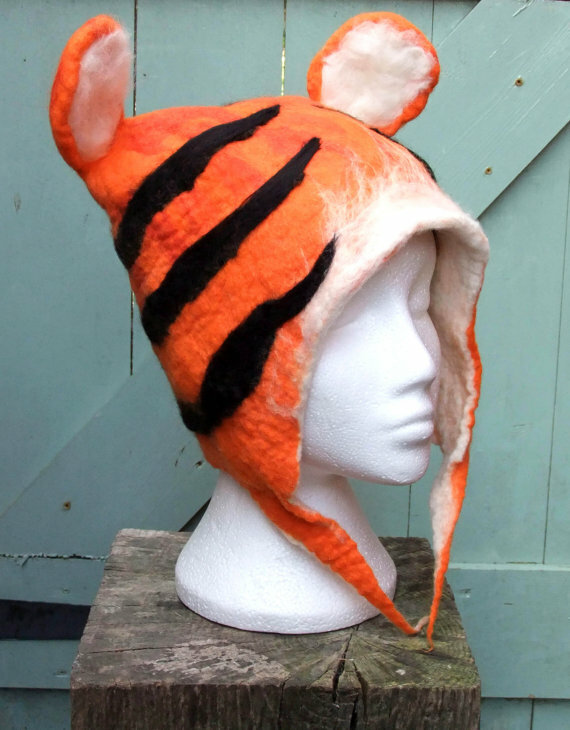 When you buy an Amie Boswell product you can be safely assured that you have a unique item. As every individual item is made by myself in small quantities it is very unlikely that you will ever see anything exactly the same anywhere else……. 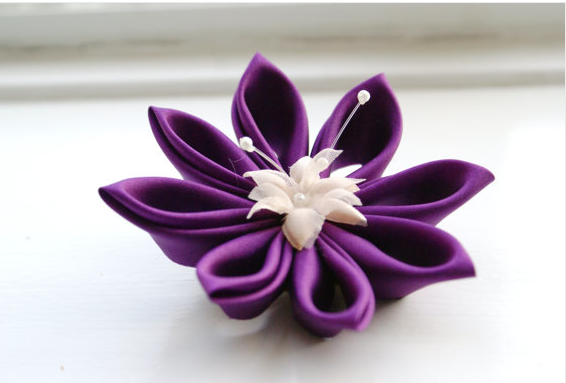 I make hair accessories and brooches from folded silk and other fabrics. 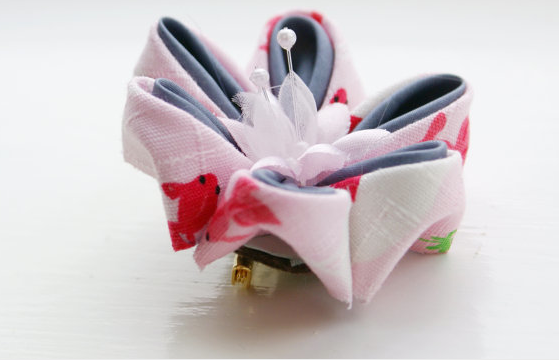 They are inspired by the Japanese traditional craft of kanzashi making. Kanzashi just means ‘hair ornament’ in Japanese, but there is a particular technique for folding silk squares into petals which is the basis for all my designs. I am inspired by traditional Japanese style and colour sense, particularly the love of seasonality, so wearing things that suit the season. 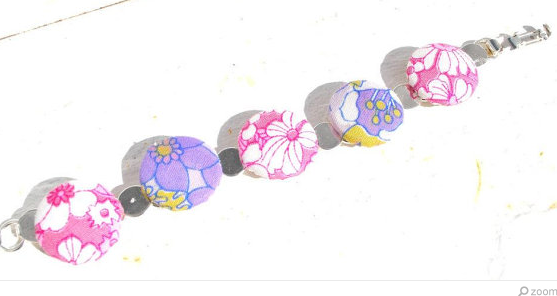 But I am also inspired by modern Japanese fashions for kimono wearing (I collect kimono) and want to create accessories and jewellery that are modern and wearable for UK woman today who have a love of Japanese style! I’ve been making since September 2010 and selling them since May 2011. 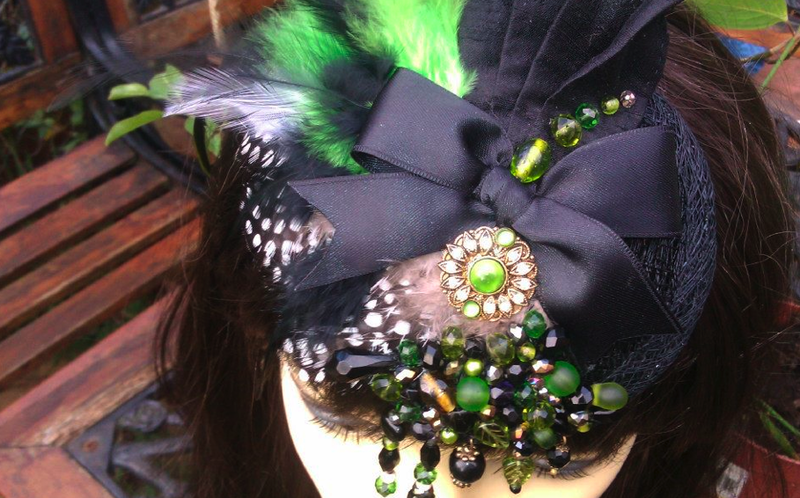 This particular style is very popular (below), I think because it is fascinator size, but quite simple, so it makes a very affordable fascinator: see it here. It sells best in bridal colours! 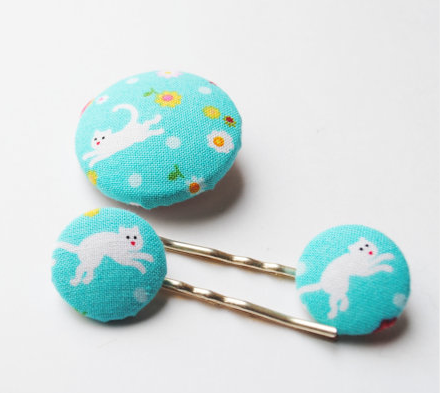 I find it really soothing just sitting down and making them, but I also love the sociable side which comes with it, meeting other makers, chatting to customers – I get a real kick when I make a sale too! I love the reward of making really elaborate pieces and the amazing feedback I get from those! Do you take part in other craft events? I try and do a craft fair at least once a month, but not more than twice a month or I get too overwhelmed and don’t have any time off with my husband. I do the Open Houses too- in fact I am on the lookout for a Christmas Open House at the moment! If exhibitions come up I try and do those too as they are good opportunities. What products/ items will you be selling at The Fairy Tale Fair? 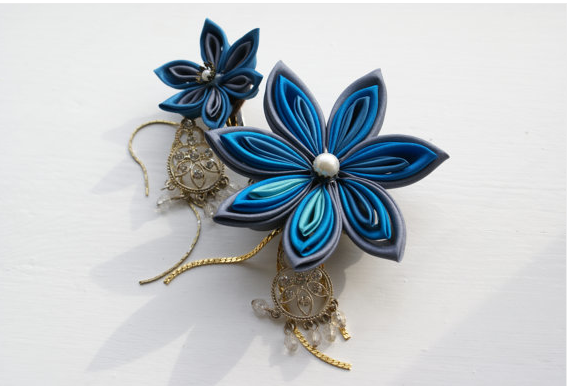 I am going to be selling my usual range of hair clips and brooches ranging in size from teeny tiny, to huge and bold, all in jewel coloured silks. I’ve also just made a range of hair sticks, which are proving very popular. I will have a very select range of pieces in vintage kimono silk, my favourite of which are the necklaces, another new line for me! The kimono silk pieces are really something special and most pieces are absolute one offs! I’d like to find some more wholesale stockists and shops to stock my work. I am currently only stocked by the Royal Pavilion Shop in Brighton, and I’d like to build on that. I would also like to be featured in more magazines! I need to finish editing my photos and get a press release together in order to achieve that though! 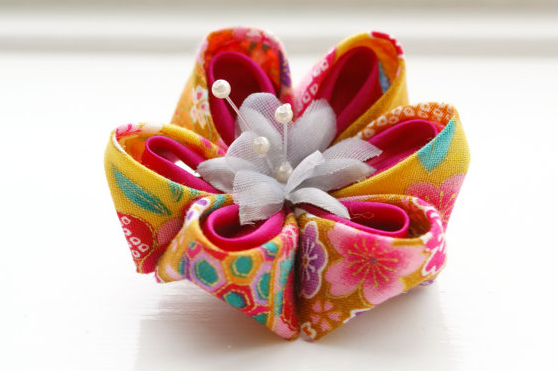 We can’t wait to see how pretty Cuttlefishlove Kanzashi’s stall looks at The Fairy Tale Fair- make sure you don’t miss it! 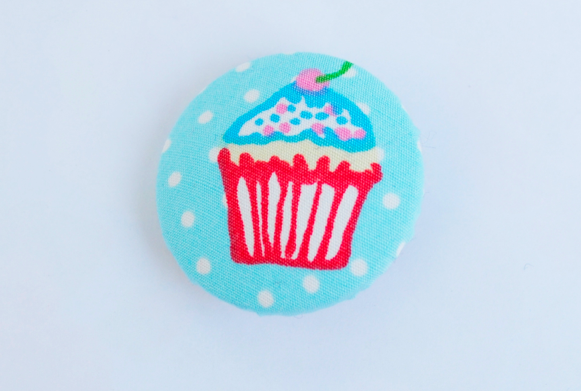 I cover buttons in vintage and retro fabrics and make them into original acessories with a vintage feel. This now includes hairclips, bracelets, earrings,cufflinks and brooches with the odd catnip mouse,bunting and cushion thrown in for luck. I also sell vintage china, books and wares. Nostalgic, I wanted to use my love of old fabrics and patterns. I am a vintage girl at heart but as I’m also a mummy. I introduced a childrens range but it still has an old fashioned style mixed with modern fabrics. Just coming up to a year! 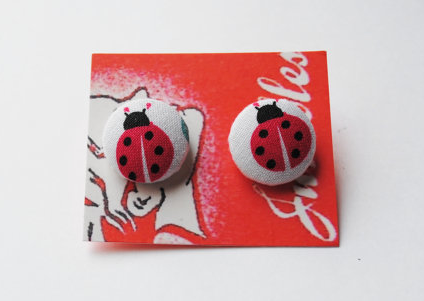 Yes, at the moment my best sellers are my rockabilly cherry earrings and my ladybird clips. The fact that I can fit it around being a mum and the excitment I get of finding sections of fabrics that would look completely different once folded around a button. Did my first open house this year as part of Makers Boutique Seaside Open House but I was a last minute addition so only made a small range of nautical buttons. Hope to get more involved next year. I am a regular stall holder at Makers Boutique which is on the first Saturday of every month at the Unitarian Church, New Road, Brighton. I also have a regular pitch at The Yard vintage and makers market which is on the second and fourth Sunday of every month at Diplocks Yard, North Road, Brighton. I usually sell my vintage ware there once a month. I have done a few other fairs such as Saltdean Lido funday and hope Pop Up Vintage in Hassocks is going to be a regular thing as I loved it. Button hairclips, earrings, cufflinks bracelets and if I finish designing them in time my new range of button necklaces. 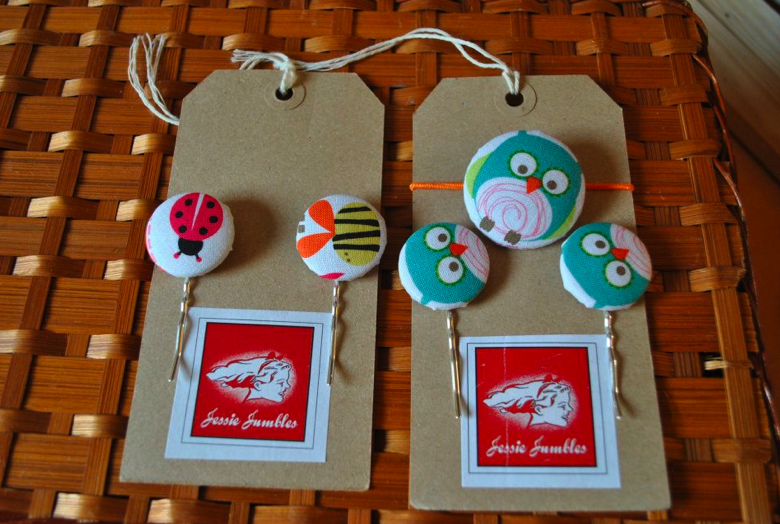 I hope to make Jessie Jumbles a quirky but known brand of accessories such as Tatty Devine. 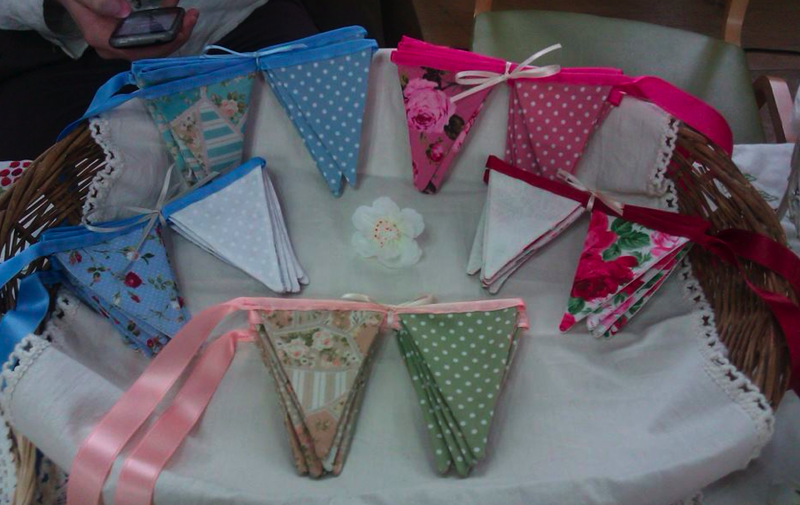 We can’t wait to welcome the very popular Jessie Jumbles and her lovely vintage style work to our The Fairy Tale Fair! I find it difficult to pin down my influences and style. It changes seasonally and depending on what I’m reading/ working on at the time. I definitely like small details, layers, raggedy edges, bit cheeky, obscure juxtapositions, and colour combinations that make my knee go wobbly. I started making stuff when at secondary school, particularly clothes, and have made it my lifestyle ever since. Best sellers come and go. At one time it was giant faerie ballgowns, now it’s large mirrors, who knows what will be next? It’s not a case of enjoying it, it’s a case of having to do it or my fingers would drop off. Apart from the Open House (The Cake House) trail I don’t do other markets as a rule. 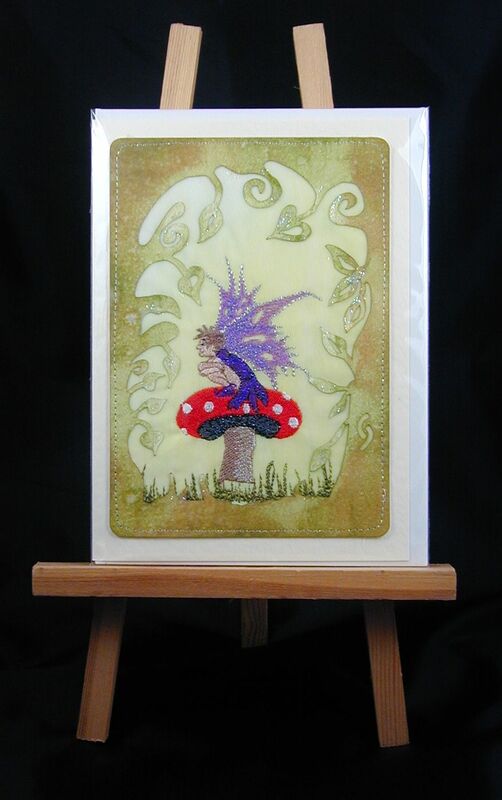 I spent years travelling with my Wicked Faerie Recycled Clothing stall, and these days sell through galleries and individual commissions. 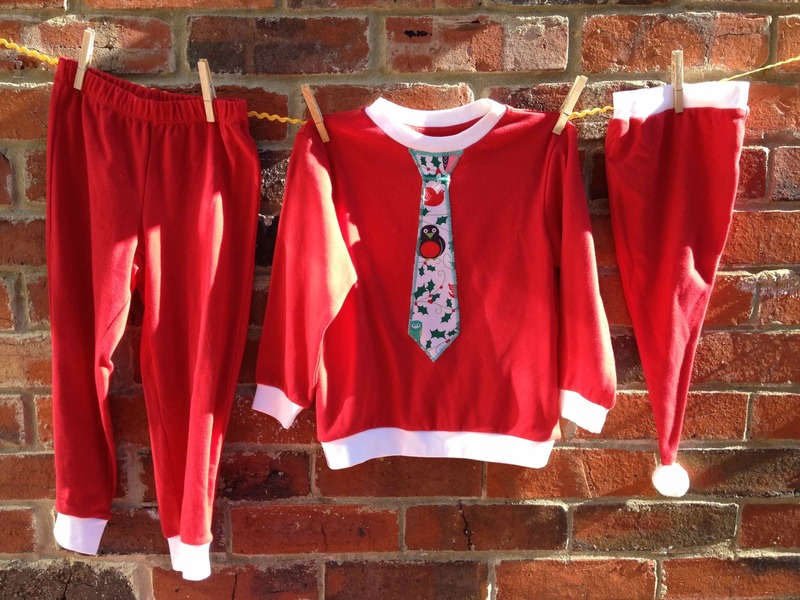 I have a range of childrens’ clothes that I will bring along. I’m also starting on an estate of faerie houses which I’m hoping to have finished, and maybe a few shrines. 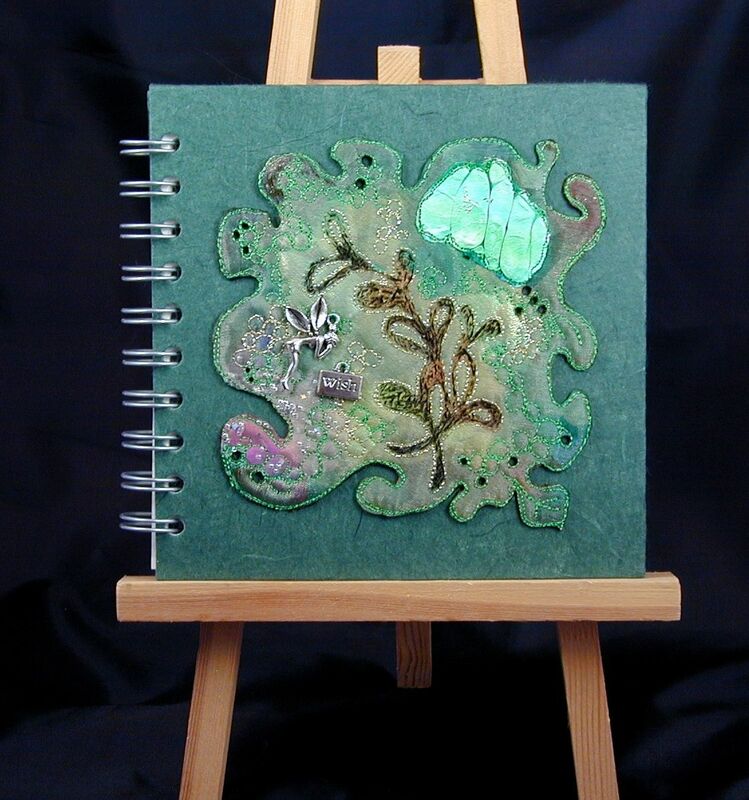 I’m hoping to expand the faerie family, and do smaller scale work. Grow more flowers! Let’s hope the sun shines on us so our wings don’t go droopy. We hope the sun shines as well. Sunshine makes fairies happy! 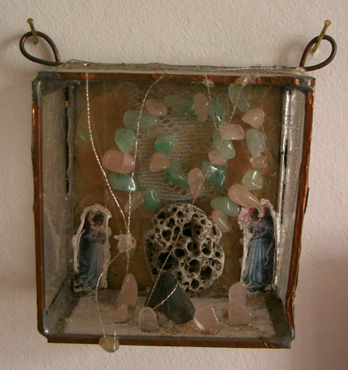 We can’t wait to see Wicked Faerie Products estate of faerie houses- in fact we might move in! Today we say hello to…Georgie Arts, who makes wonderful embroidered textiles. What I make and do. I make embroidered textiles, from framed and free hanging pieces and installations mostly to commission but also a wide variety of gifts and accessories ‘off the peg’. 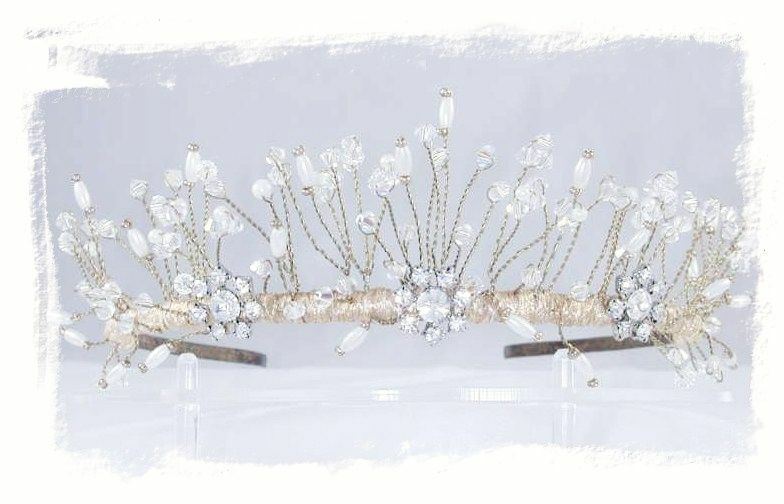 I also make bridal tiaras, favours and embroidered stationery for all special events. 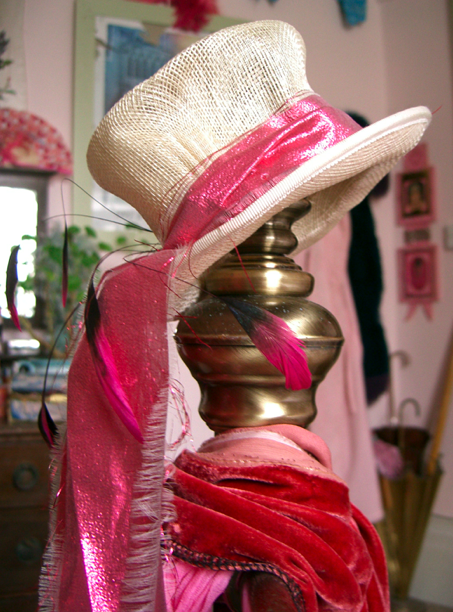 I’d describe my style as colourful, detailed and luxurious. 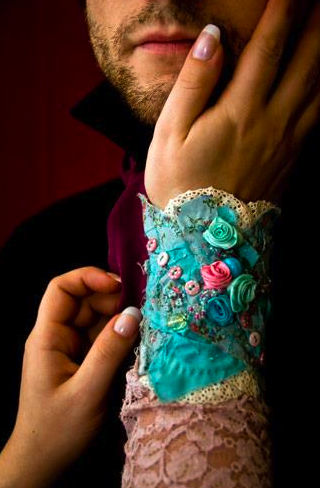 Hand and machine embroidery, beading and embellishment on mixed media and hand- made and dyed fabric surfaces. How long have I been making my craft? I’ve stitching all my life, professionally since 1979 after my apprenticeship with the Royal School of Needlework, but in a more experimental and mixed media way for the last ten years or so. It’s hard to say, customer choices ebb and flow. 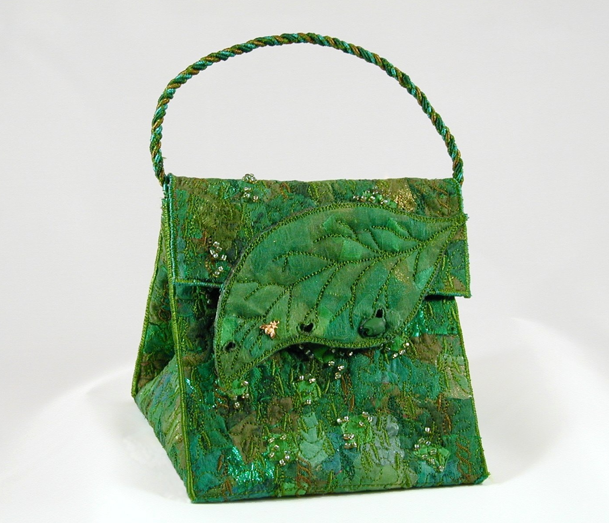 Perennial favourites are my bags and I’m constantly making bespoke embroidered cards for special occasions. But everything has it’s moment for which I’m grateful! What I enjoy most about my craft. It’s a wonderful thing to be constantly doing what I love most. Working with exquisite materials and colours, constantly following new themes and finishes and meeting with other artists and creative minds makes my work a great pleasure. Do I take part in other craft events? 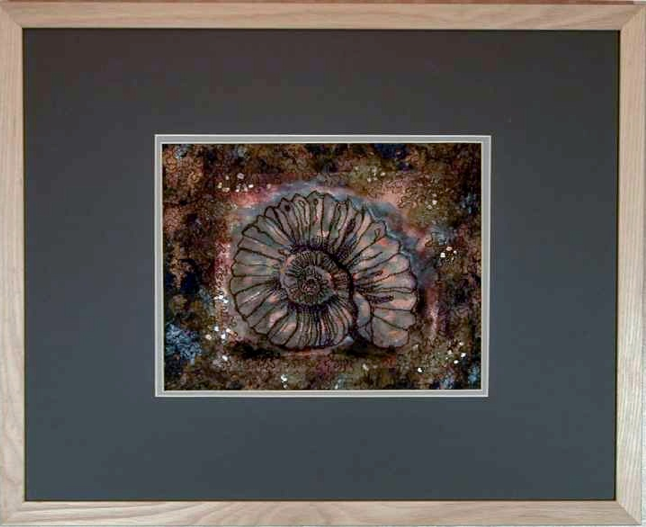 I’ve had a few exhibitions, exhibited at Country Fairs and a few art and craft fairs, but am mostly reached through my website and by word of mouth. I sometimes get invited to talk about my work at embroiderers groups, craft and ladies groups which is always very enjoyable. Products I’ll be selling at The Fairy Tale Fair. There will be plenty of sparkle on the day, a few specials and a selection from my range including beautiful evening and occasion bags with my signature hand- made fabrics, little note/sketch books with gorgeous scrunchy and leaf strewn covers and richly coloured jewellery rolls. You’ll find embroidered and silken greetings cards, little boxes just the right size to house a fairy or little treasure and a few sparkling tiaras and hair pieces from my bridal range. Plans and ambitions for the future? I’d like to get my work to a wider audience and so plan to work harder on my website and perhaps start a blog. 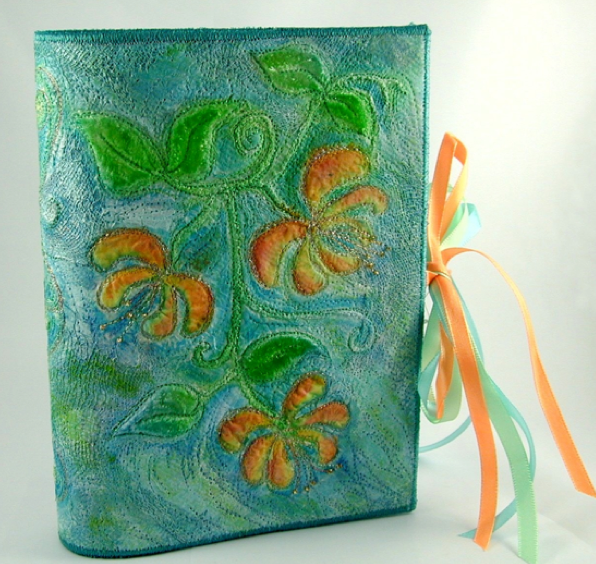 To work with some of the great textile artists and embroiderers would be exciting and I’d love to write a book. Someday I’ll find time between my stitching! Oh, and I’d like to have a larger studio someday with an organised place for everything before I drown in fabric and thread. 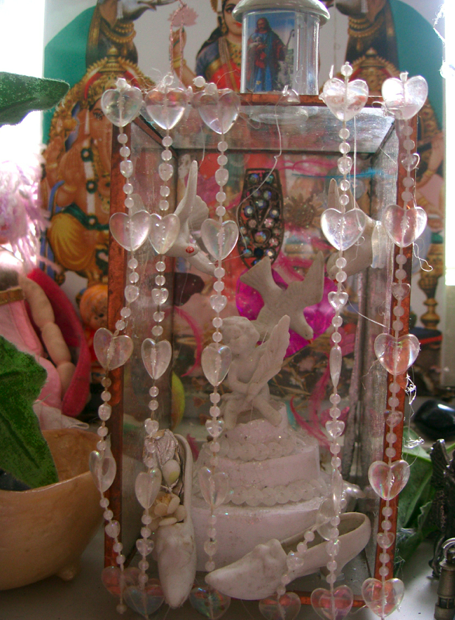 Since I started work on this event I’ve had a few problems with fairies getting into my studio. They’ve left shoes, hats and other possessions which have got caught up in my embroidery and there’s fairy dust in everything. So I’ll be bringing a selection of ‘Fairy lost property’ with me! We can’t wait to see Georgie Arts creations! And the fairies can be sneaky leaving their fairy dust everywhere- they can’t wait to see all the hats and embroidery all sparkly!